Methamphetamine, also called meth or crystal meth, among other names, is a psychostimulant drug mainly known for its recreational use. 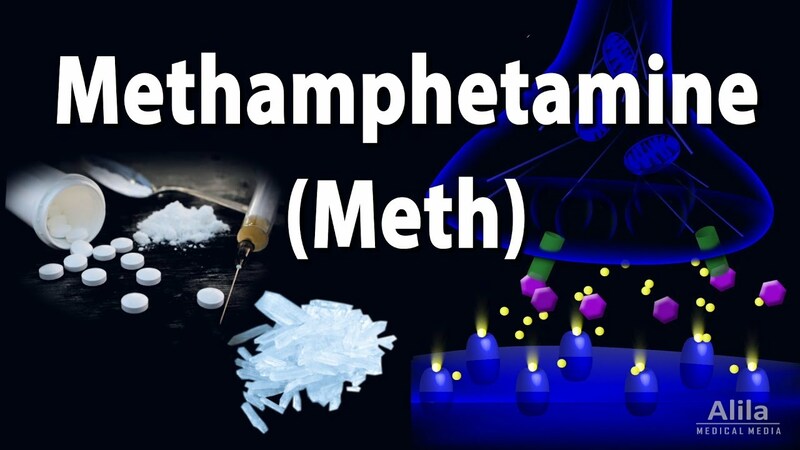 Methamphetamine is chemically similar to amphetamine, a drug used to treat attention-deficit hyperactivity disorder, obesity and narcolepsy; but being more potent and highly addictive, methamphetamine is rarely prescribed for medical treatments. Most commonly, the drug is produced illegally, from pseudoephedrine, an ingredient in cold medicines. It can exist as white powder, pills, or bluish-white crystals, and can be consumed by swallowing, smoking, snorting, or injecting. Methamphetamine acts to increase the amount of a neurotransmitter called dopamine in the brain. Dopamine is at the basis of the brain reward pathway, which is designed to “reward” the body for important behaviors that are essential for survival, such as feeding when hungry. Engaging in enjoyable activities causes dopamine release from dopamine-producing neurons into a space between neurons, where it binds to and stimulates its receptors on the neighboring neuron. This stimulation is believed to produce pleasurable feelings or rewarding effect. Normally, dopamine molecules are promptly cleared from the synaptic space to ensure that the postsynaptic neurons are not over-stimulated. This is possible thanks to the action of dopamine-transporter, which channels dopamine back to the transmitting neuron. Methamphetamine binds to dopamine-transporter and blocks dopamine re-uptake. In addition, it can enter the transmitting neuron and trigger more dopamine release. The result is that dopamine builds-up in the synapse to a much greater amount than normal. This produces a continuous over-stimulation of receiving neurons and is responsible for the prolonged and intense euphoria experienced by drug users. At a low dose, methamphetamine stimulates the brain and can elevate mood and alertness; and by accelerating heart rate and breathing rate, it increases energy in fatigued individuals. It also reduces appetite and promotes weight loss. These seemingly “positive” effects keep users coming back for more, eventually leading to addiction and potential overdose. Long-term drug users may experience extreme weight loss, severe dental damage, and constant hyperactivity which results in anxiety, sleeping disorders and violent behaviors. Overdose takes the drug’s effects to the extreme and can cause psychosis, heart attacks, seizures, strokes, organ failures, and even death. Currently, there is no approved pharmacological treatment for methamphetamine addiction; the most effective treatments are cognitive behavioral therapies.